I had the immense pleasure of spending a few of my days with the wonderful gang at CRUK last and there are certainly some amazing things going on over there. On Thursday I was asked to speak at the Region 5 conference in Woburn which was held at Woburn Safari park. I must admit I saw the words ‘safari park’ before I saw anything else so immediately said yes! :) It turned out to be the most amazing day where I met loads of amazing fundraisers and listened to a very inspirational talk by two incredible researchers who told us all about the incredible Francis Crick Institute which is set to open next year. Francis Crick was one Britain’s greatest ever scientists and famous for discovering the DNA double helix structure. This Institute is set it to turn cancer on its head by CRUK teaming up with 5 of the worlds leading medical research organisations. This exciting collaboration is all about bringing together the worlds greatest minds and figuring out new techniques for treating cancer and a whole host of other illnesses. The last 10 years have brought about such wonderful developments in treatments and the next 10 years are set to bring about even more incredible life saving developments in cancer research. Brain tumours, pancreatic cancer and childhood cancers are very much on the agenda so there will some exciting work taking place when the centre opens. I then got the chance to visit one of cancer research UK’s labs in London on Friday and saw the exiting things going on there. I would love to update you all with all I learned but there were some big words being used and all I really understood was that there are lots of successful clinical trails, new cutting edge treatments and the outlook was looking very very good! Which was all I really needed to hear. Lots of very clever people doing very clever things. 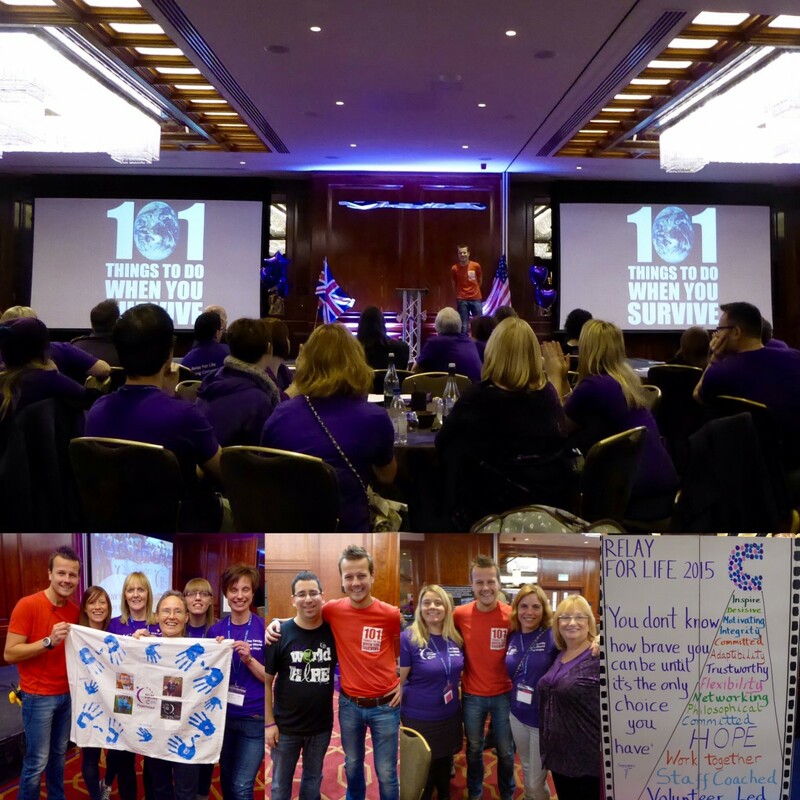 My week with CRUK came to a climax as I was asked to be the closing speaker of the two day Relay for Life Summit in London. 200 ridiculously inspiring people from relays all over the UK coming from places as far wide as Scotland and Gibraltar. There was even a representative from the American Society there who came all the way from Chicago to see how it’s done properly! :) They were all so welcoming to me and to receive a standing ovation at the end of my presentation was just mind blowing and extremely overwhelming. I didn’t know what to do with myself. Should I wave, bow or just hide! :) It was an amazing moment and one which I will never forget. A huge thank you to everyone for making me feel so welcome. Relay for life raised over 2.4 million pounds this year for CRUK which is just astonishing. This event isn’t really promoted as much as other fundraising events and is organised by volunteers. I can safely say it’s my favourite one by far. It’s fun, it’s inspiring and you are surrounded by the most amazing people. I went to my first relay in Australia and then again here in the UK and I just love it. I am creating a team for next year so if you fancy coming to hang out with me and the rest of the crazy relayers then please let me know and we can work our Team 101 magic and raise some cash whilst having a grand old time. After the sad and horrific events in Paris on Friday it’s easy to think that the world is a horrible evil place. I loved my talk on Sunday even more than usual because I could once again remind people that the world we live in is a very beautiful place filled with incredibly kind and loving people. Sadly there are a few idiots in this world who like to try and ruin it for the rest but they really are just a few. For a little injection of hope when it comes to our old foe cancer, please take a look at the annual review for cancer research UK. I read it and I was extremely impressed and hopeful for the future. Huge congratulations to everyone at CRUK. You are changing the world.